Miep Helfrich is emeritus Professor at the University of Aberdeen. She studied cell biology at the University of Wageningen in the Netherlands, where she became interested in microscopical imaging. She obtained her PhD in 1988 at the University of Leiden, the Netherlands, where she studied osteopetrosis and developed her interest in ultrastructural imaging of osteoclasts. She moved to the group of the late Prof. Mike Horton in London to study the role of integrins in bone cell function and did a second postdoc at the University of Aberdeen working with Prof. Stuart Ralston on Paget’s disease of bone. 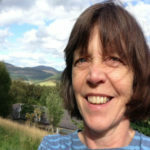 She then continued working as independent fellow on the role of nitric oxide in bone and in 2002 became the academic lead of the microscopy core facility in Aberdeen. She was appointed to a senior lectureship in 2004 and to chair in Bone Cell Biology in 2009. Her research has focussed on understanding the etiology of osteoclast diseases, such as osteopetrosis and Paget’s disease of bone, and in improving ultrastructural imaging of bone cells and bone tissue, including osteocytes. Most recently she did this work as a partner in the consortium “Euroclast” a PhD training network focussed on osteoclast research. She was board member of the ECTS from 2009-2012 chairing its Training Committee and was president of the Bone Research Society from 2016-2018.